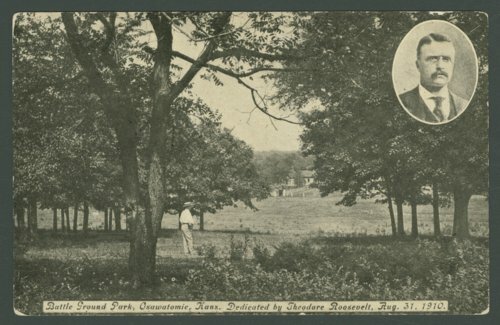 This sepia colored postcard shows the John Brown Memorial Park in Osawatomie, Kansas. The 22 1/2 acre land is the site of the "Battle of Osawatomie" where John Brown and thirty free-state defenders fought in 1856 against 250 pro-slavery militia. On August 31, 1910 former President Theodore Roosevelt dedicated the park.